5 Easy Steps to Making a Grape Trellis | My Garden Trellis - Make Your Garden Beautiful! If you are planning to grow grapes, you should know that a grape plant is actually a vine, which means it requires some kind of support to climb up to. This particular support is called a grape trellis. In creating a trellis for your grape vines, it is crucial to find the best materials which can maintain the weight of the vines as well as the right understanding on how to build one. Here are the steps to make a grape trellis. 1. Organize all the materials and tools that you’ll need in constructing a trellis for your grape plants. This will depend on the type of trellis that you want to build. It could be made of wood or some wooden posts with wire. 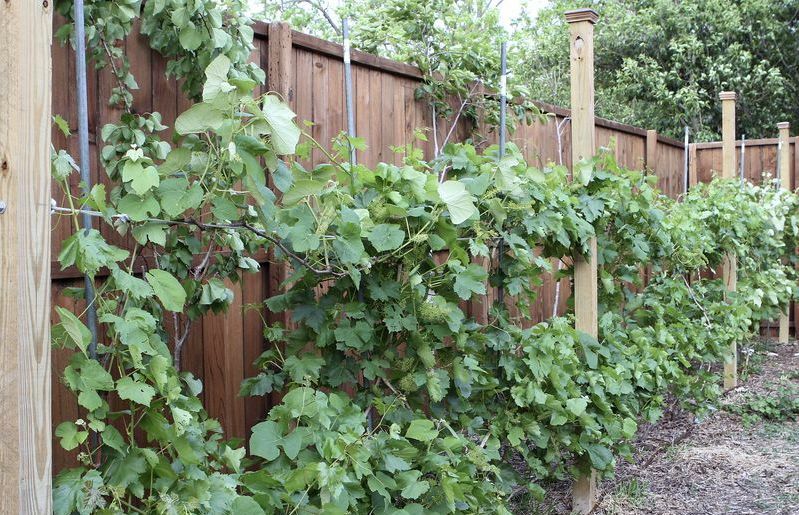 Should you have quite a few grape plants, you might want to build a long trellis and something that can support the weight of a rapid growing grape vine. But if you only have a few grape vines, you can just construct a grape trellis using sticks. Keep in mind that the trellis also needs to be sufficiently strong to withstand all types of weather. You don’t want to construct something which you’ll just rebuild in a couple of weeks. Make something which will last long. 2. If you have a medium-sized or a big vineyard, it will be better if you come up with a plan first. You have to know the dimensions and precise locations in which you want to put your trellis. You can use wooden stakes for this step or anything that will serve as a marking. Make sure that you are providing your grape vines adequate spaces in between them. If you are planning to grow only a few grape plants in your backyard, it is fine if you do not map out the places where you wish to put the trellis. 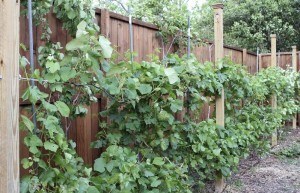 Using a wooden trellis made of simple sticks is just fine for the grape plants in your backyard garden. There is no need to create an elaborate trellis. Just make sure that it is capable of supporting the weight of your grape vines. 3. After coming up with a plan, you can now start digging. If you use wooden posts, dig a hole in the earth about two feet deep. Put the post into this hole and cover it with concrete. This ensures that your posts are not wobbly. 4. Let the concrete to dry for a couple of days prior to adding the wires. Affix the wires on both end posts and secure them using screw eyes. For the in-between posts, simply staple the wires. They don’t have to be secured tightly. 5. 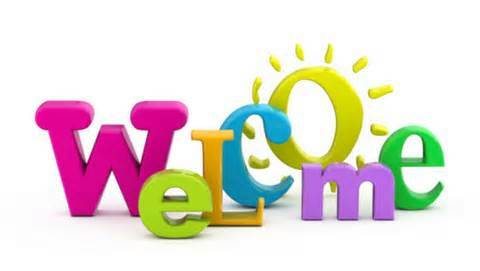 Examine each and every post to make sure they are sturdy and strong. If everything checks out you can now start planting your grape plants. Make sure that you read what you need to know about the specific grape variety you have chosen to plant. Grape trellis should be prepared before you decide to plant grapes. Grapes grow quickly and their vines could spread rapidly in the first year. Make sure that by the time this occurs, your grape trellis is already ready for its function of supporting your grape plants.